Most people, I presume, would like to be healthier. They'd like to eat right and use natural products, and reap all the benefits that come from that. That kind of lifestyle comes with a cost, though. By that I mean a literal cost, given how expensive healthy products often are, putting them out of reach for the average consumer. "In traditional retail, especially in personal care and food, there’s been a choice between high price and low quality. This is partly due to brand positioning and partly to a dated supply chain that drives up price," said Morgan Hirsh, founder and CEO of Public Goods, told me. Public Goods is on a mission "to make healthy products affordable to all." The company offers premium, natural, and environmentally conscious products, charging subscribers $59 a year to delivery products on a monthly basis. 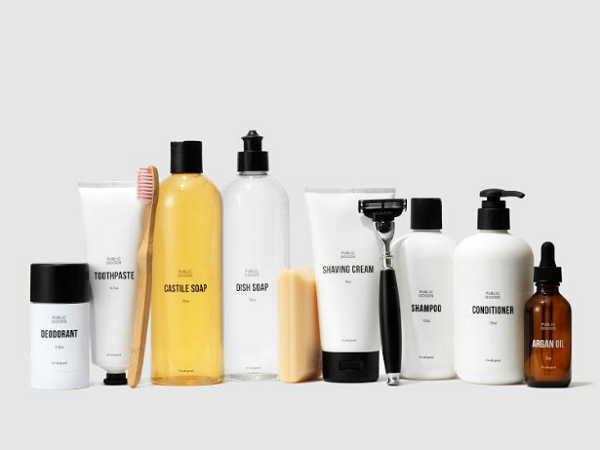 Right now its product line includes home and grooming items, such as shampoo, conditioner, body wash, lotion, dental floss, breath mints and razor blade. "By selling direct and at our cost, and instead making money on memberships, we can deliver healthy high quality products at a fraction of the price of traditional brands," Hirsh explained. This week, the company announced it has raised $3 million in seed funding. The round was led by Yes VC with participation from Listen Ventures, Day One Ventures and existing investors. Public Goods currently has tens of thousands of customers and is growing at about 20 percent per month. The new funding will go toward supporting Public Goods' expansion into new product categories, including food and drink, which will be launching in the fall of this year. Explaining why food and drink is an important category for Public Goods, Hirsh put it pretty succinctly: "Because people eat and drink. "With the way direct to consumer is going there’s going to be a company for every product category. This is an unnatural unbundling of the shopping experience that we think will stop being attractive. Too many relationships with too many DTC brands. We’re building one place people can trust where they can easily stock their homes with everything they need," he said. In addition to the new funding, it was also revealed that Caterina Fake, General Partner at Yes VC,and Rick Desai, Partner at Listen Ventures, have joined the Board of Directors at Public Goods. "Caterina founded Flickr which was acquired by Yahoo and Hunch that was acquired by eBay. She was an early investor in Kickstarter and Etsy where she was Chairman of the board up until IPO. So she’s been down the road we’re on before, both as an entrepreneur and investor," Hirsh explained. "Rick’s fund Listen focuses on brands, so he has a perspective that no CEO can possibly have. His day to day is looking at businesses from the inside and out. Many that aren’t competitive with us, but might be facing the same challenges." The ultimate goal for Public Goods is to "build a brand people can count on for healthy stuff." "Healthy for us and our planet. Big online retailers don’t stand for anything and this can be really destructive, especially when these companies gain too much power. I’m building a healthy alternative for people," said Hirsh.